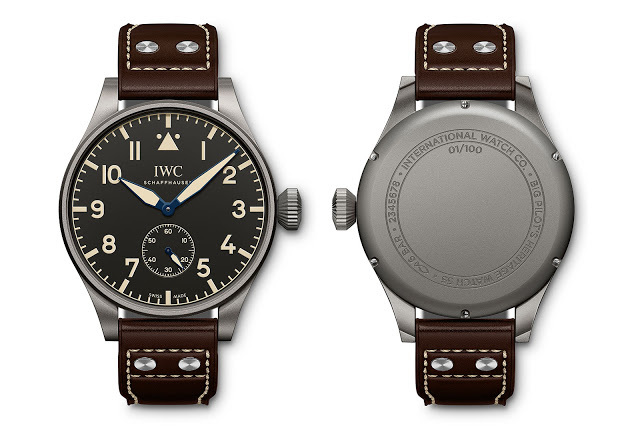 IWC will unveil an all-new line of pilot’s watches at SIHH 2016, led by the new Big Pilot’s Heritage Watch 48 and 55, a pair of limited editions modelled on the oversized aviator’s watches of the Second World War. 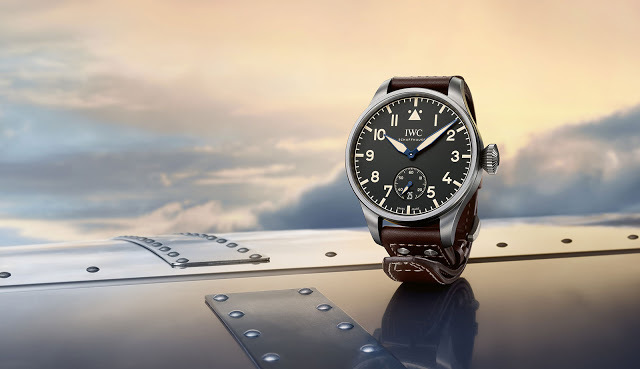 IWC‘s contemporary aviator’s watches are inspired by the beobachtungsuhr, or observation watches, it supplied to airmen of the German Luftwaffe during the Second World War. Those pilot’s watches get a makeover this year – acquiring a more conservative look that traditionalists will appreciate – with the new model range making its debut at SIHH 2016. The line-up starts with the entry-level Mark XVIII, and also includes a pair of historical remakes in titanium, the Big Pilot’s Heritage Watch 48 and 55. The numeral suffix for each model refers to the case size, 48 mm and 55 mm respectively. While the larger size is historically correct, being identical to the Second World War originals, it is too large to be practical. Fortunately, both of the Big Pilot’s Heritage Watches have titanium cases, making them relatively lightweight, with the 55 mm model weighing less than 150 grammes and the smaller one 120 grammes. The titanium case is sandblasted for a grained, matte grey finish that approximates the look of the chrome-plated brass cases of the WWII originals. The dial is likewise similar to the original, with the most notable feature being the return of the “9” numeral, something that was exiled from IWC pilot’s watches starting in 2002. And the distinctive triangle marker at 12 o’clock has also been lowered to more closely resemble the originals (in recent years the marker was almost at the edge of the dial). But in contrast to the original, the new Big Pilot’s Heritage remakes both have a sub-seconds at six o’clock, instead of a centre seconds. Movements That’s a consequence of the movements used in each watch. 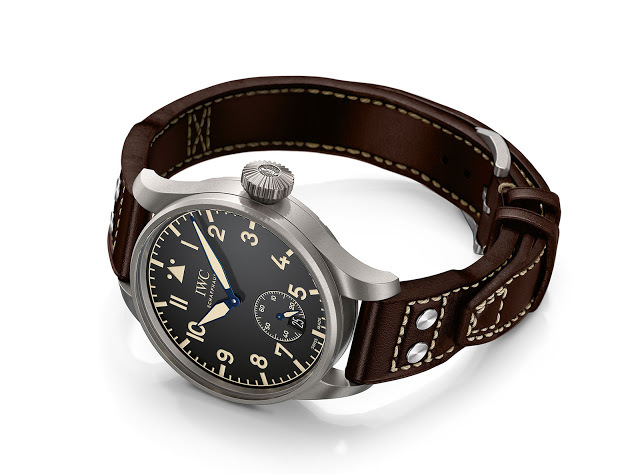 The larger Big Pilot’s Heritage Watch 55 is powered by the hand-wound calibre 98300, also known as the F.A. Jones movement. Distinguished by its elongated, needle-like regulator index, this movement used only in limited edition Portuguese watches in the past (and also a few Ralph Lauren watches). It is a basic movement designed to resemble a pocket watch calibre and was absent from the catalogue for some time, so IWC has either put it back into production, or has yet to run down its inventory. 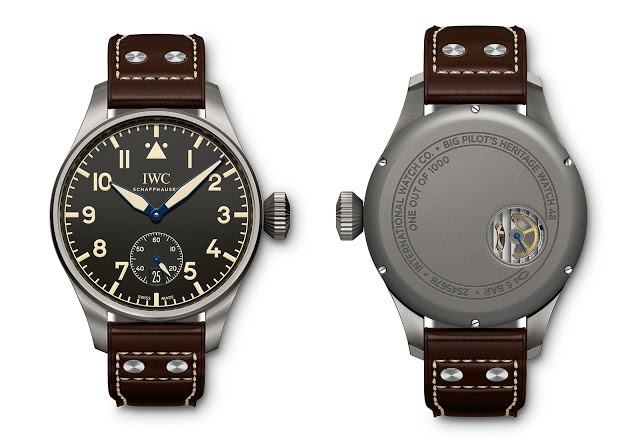 The Big Pilot’s Heritage Watch 55 is a limited edition of 100 watches, each individually numbered on the back. Inside the Big Pilot’s Heritage Watch 48 is the more modern calibre 59215, the same eight day power reserve movement found in the Portuguese Hand-Wound Eight Days. This has a power reserve display on the rear, visible through a porthole on the case back. The Big Pilot’s Heritage Watch 48 is an edition of 1000 watches, each labelled “One Out of 1000”, rather than having a specific number. And all the other pilot’s watches While no images have been released yet, here’s are the rest of the new pilot’s watches. Most of them take after the Big Pilot’s Heritage Watches, with a “9” as well as a lowered 12 o’clock marker. Additionally, the triple date window that was previously a hallmark of the line has been exorcised. All in all, the look is more traditional. Pilot’s Watch Time-zoner Chronograph Pilot’s Watch Automatic 36 Pilot’s Watch Mark XVIII Big Pilot’s Watch Pilot’s Watch Chronograph Big Pilot’s Watch Spitfire Pilot’s Watch Perpetual Calendar Digital Date-Month Spitfire Big Pilot’s Watch Annual Calendar Edition “Le Petit Prince” Big Pilot’s Watch Edition “Le Petit Prince” Pilot’s Watch Chronograph Edition “Le Petit Prince” Pilot’s Watch Mark XVIII Edition “Le Petit Prince” Big Pilot’s Watch Perpetual Calendar Edition “Antoine de Saint Exupéry” Pilot’s Watch Double Chronograph Edition “Antoine de Saint Exupéry” Big Pilot’s Watch TOP GUN Big Pilot’s Watch Perpetual Calendar TOP GUN Pilot’s Watch Chronograph TOP GUN Pilot’s Watch Chronograph TOP GUN Miramar Pilot’s Watch Mark XVIII TOP GUN Miramar More details will be posted on January 18.